A simple walk through the woods exposes you to numerous natural remedies, if you know what to look for and how to prepare it. Growing up in the Comox Valley I have always been passionate about nature and the outdoors. Camping, hiking, fishing, animals, plants, and fungi. Since I was 10 years old I have wanted to know what I can eat and how I can survive if I were stuck out in the wilderness. I’m also drawn to the idea of using the wild food around me to prepare a meal while camping. I became even more involved with plants and mushrooms through my passion for herbal remedies and the concept of food as medicine. Not everything that’s edible or medicinal in the wild can be consumed in large quantities. 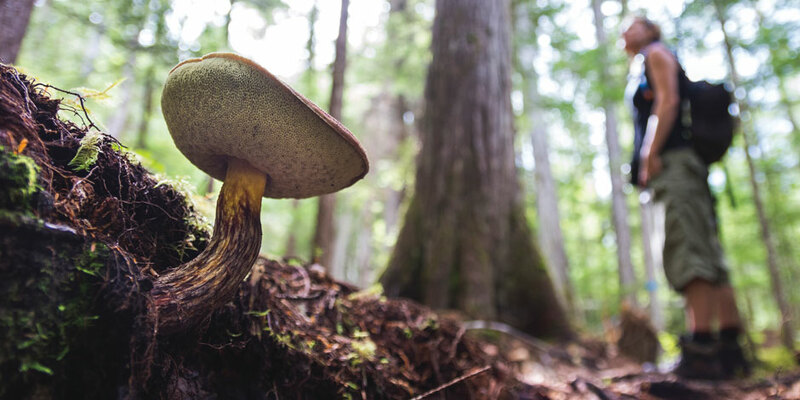 In the fungi kingdom, some of the medicinal mushrooms are too hard and woody to eat, but can be boiled or simmered into a tea or soaked in grain alcohol to make a tincture. Typically the tea extracts the sugars, and the tincture extracts the proteins. A great example of this is the hard, woody tree mushrooms refereed to as conks or polypores like the turkey tail “Trametes versicolor”, artist conk “Ganoderma applanatum” and the agarikon mushroom “Fomitopsis officinalis”, aka “tree biscuit” or “ghost bread”. These types of medicinal fungi are always used as a tea or tincture unless they’ve been prepossessed into a powder form. Medicinal mushrooms you can eat include the lion’s mane “Hericium erinaceus”, shiitake “Lentinula edodes” and maitake “Grifola frondosa” aka “hen of the woods”. Lion’s mane is a delicious, edible mushroom with medicinal qualities that help to protect and regenerate the nervous system, while shiitake and maitake are good for the immune system. One of my all-time favourite wild foods is the stinging nettle. Although I do enjoy it as a tea, the young shoots can be steamed or boiled into a soup and consumed in large quantities. Stinging nettle contains a fair amount of protein, fiber, vitamins, and minerals. It is quite filling. Some other popular uses are nettle pesto, or as an ingredient in lasagna and spanakopita. Other things like dandelion leaf are harder to consume in large quantities but also contain a full spectrum of vitamins and minerals, and are great for liver function. The root of dandelion is also roasted and boiled to be consumed as a coffee substitute. Between plants, mushrooms, seaweeds, seeds, berries, and flowers, I’m usually picking something every month of the year. Aside from the nutritional benefits of individual fungi and plants, I find the process of going out into the forest and harvesting these materials to be healing and beneficial as well. I have found it rewarding to get out often, to create a routine, and enjoy collecting for myself and my family. I also love to teach others. Passing on the information keeps my mind fresh and encourages me to continue learning.